The all-new 2014 Acura MDX, the third generation of Acura’s signature 7-passenger luxury performance sport utility is more refined than before with new innovations, technologies, convenience, luxury, comfort, higher levels of performance and safety systems that will surely keep the MDX on every luxury SUV customers list of test drives, plus It is also the first MDX to offer a 2WD model. I tested the MDX with the Super AWD transmission with the Advance, Entertainment and Technology Packages that made my test drive pure pleasure in every respect. This new MDX offers more standard equipment than before including Keyless Access System, push button start/stop, Jewel Eye LED headlights, exterior and interior LED lighting, extended slide second-row seating that slides the second-row seats forward at the touch of a button for easy third-row access, an eight inch On-Demand Multi-Information Display touchscreen, expanded view driver’s side mirror, a powerful 432-watt Acura sound system and acoustic glass windshield and front windows that further decreasing sounds from entering the cabin. The ‘top-of-the-line’ MDX with Advance Package adds a wide range of new technologies and features such as Lane Keeping Assist System, Adaptive Cruise Control with Low-Speed Follow, a remote engine start with an extended range of at least 300 feet, a new Ultra-Wide DVD Rear Entertainment System with HDMI connectivity, remote control, two headphones and front/rear parking sensors. 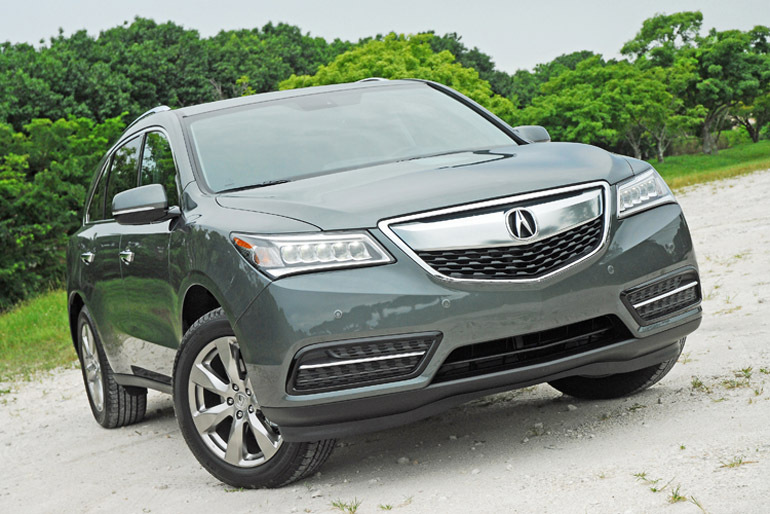 Optional Acura Genuine Accessories for the 2014 MDX includes stand-alone features such as a heated steering wheel, LED foglamps, and a Trailer Hitch ATF Cooler (allowing for up to 5,000lbs. of towing). The fully loaded MDX that I tested offered even higher levels of luxury, comfort and quietness, together with an exhilarating dynamic performance, class-leading fuel economy ratings and advanced safety features, and an even more luxurious, technology packed and versatile passenger cabin that thrilled me to my bones. The all-new MDX was designed and engineered from the ground up and the styling of the exterior is bold, aggressive and more refined than before with a European cache. The front fascia shows the signature ‘overbite’ aluminum grille and lower intake but the headlights are now a row of powerful LED units that light up the night like I’ve never experienced before. From the side is a lower profile steeply raked windshield A-pillars, flared fenders, longer doors with a full perimeter chrome strip around the greenhouse, spear-shaped pull-out door handles, aero-shaped power-remote/heated sideview mirrors, and sculpted lower side extensions. The rear view shows a top-mounted spoiler, large wraparound LED lamp clusters, a rear power liftgate that juts out with a step up bumper, chrome ringed red reflectors down below, and a single exhaust tip hidden underneath for a cleaner look. 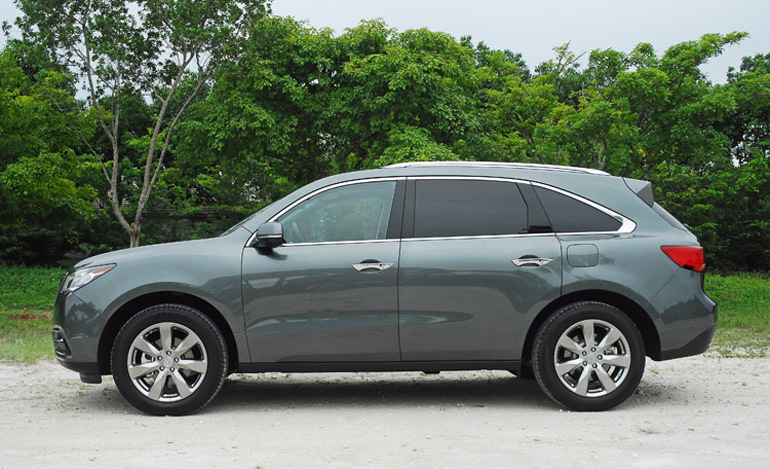 New from the ground up, the 2014 MDX has a 2.8 inch longer wheelbase, and is lower and narrower for reduced frontal area and enhanced fuel efficiency. 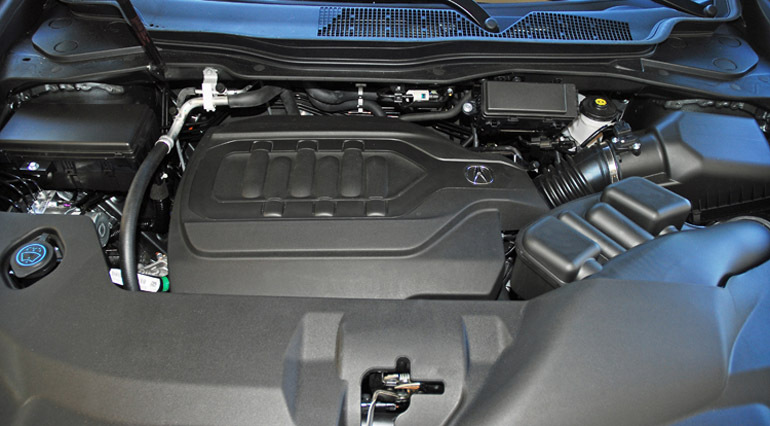 With high-strength steel, aluminum and magnesium comprising 64% of its body structure, the 2014 MDX is more rigid and torsional plus it is 275 pounds lighter than before with the lightest published weight in its segment, which directly contributes to improved acceleration, nimble handling and class-leading fuel economy ratings. 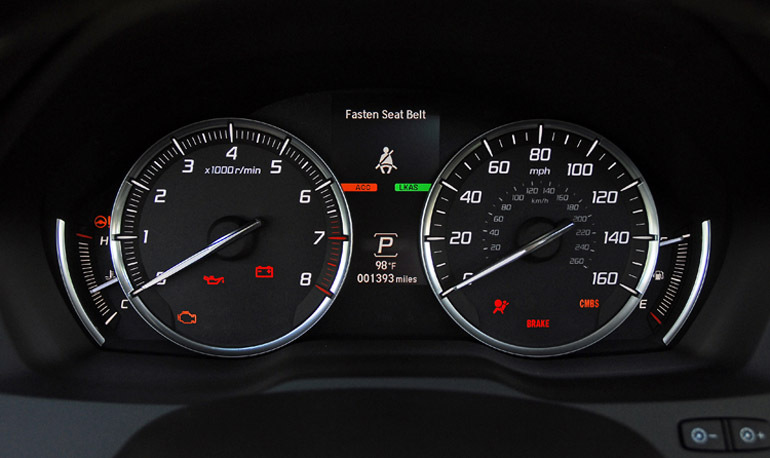 Power to move the all-new MDX quickly is an all-new, direct-injected, 3.5 liter i-VTEC, all-aluminum, SOHC, 4-valves per cylinder V6 that generates 290hp at 6,200rpm and 267lb.ft. of torque at 4,500rpm. Closely related to the powerplant in the all-new Acura RLX luxury sedan, this 24-valve V6 engine is Acura’s second ‘Earth Dreams Technology’ engine which features a next-generation set of advancements that greatly enhance both driving performance and fuel efficiency. For the first time, the MDX has standard Variable Cylinder Management (VCM), which switches seamlessly between 3-and-6-cylinder modes, depending on engine load, effectively varying engine displacement to match driving conditions for improved fuel efficiency. Compared to the outgoing 3.7 liter engine it replaces, the new V6 offers an 8% increase in torque at engine speeds below 2,750rpm for greater overall responsiveness. Due to improved operating efficiency, horsepower output per liter is up 2% and torque output per liter is up 4.5% together with the new MDX’s substantial weight reduction, overall performance is enhanced, including quicker 0-60mph times of under 6sec. and 8-second quicker lap times on Germany’s Nurburgring Nordschliefe (North Loop) where both the new and outgoing models were extensively tuned and tested. This all-new powerful and high-tech engine is mated to a standard six-speed automatic transmission with sequential Sport Shift with paddle shifters located on the steering wheel that turns all four wheels through the outstanding high-tech Super Handling AWD system with torque vectoring to give the wheel or wheels with the most grip more torque whether on the road or off-road. The AWD system also features an Integrated Dynamics System that changes the MDX’s driving personality by pushing a console-mounted button for Comfort, Normal and Sport modes. I could really feel the difference in the quickness of the reaction of the MDX’s gear changes, suspension reaction, and steering feel. The fully independent suspension of the all-new MDX is definitely world-class with the three types of personalities at your disposal depending how you want the MDX to react to your inputs. Up front is a MacPherson setup with 25.4mm stabilizer bar and a multi-link setup in the rear with 26.5 inch stabilizer bar. Both the front and rear feature Telescopic Amplitude Reaction shocks that are semi-active magneto-rheological fluid fill dampers that read the road at millions of a second to react to the surface and the speed of the vehicle. This front and rear system gives better tire patch on the pavement and allows me to dial in how I want the suspension to react to my inputs at the steering wheel and throttle-easy, normal or more sporting which depends on how I feel-slightly tired from a long day at the office or fresh and wanting to take on the curviest roads. 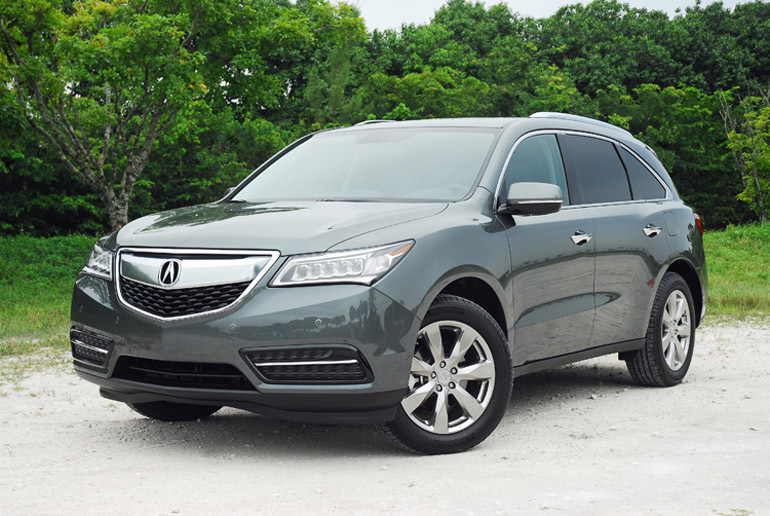 I easily guided the MDX with the new, standard, Motion Adaptive Torque-Sensing-Electric Power-Assisted Rack & Pinion steering system that gave me a much better and stronger feel for the road and a better on-center feel. I felt that I was a part of the powertrain and transmission especially in Sport mode. Quickly slowing the all-new MDX down from speed are big, power-assisted, four-wheel disc brakes. Up front are 12.6 inch vented discs clamped with dual-piston calipers and 13 inch solid discs clamped with single-piston calipers in the rear. The brake pedal is firm and very linear when I pressed down hard. 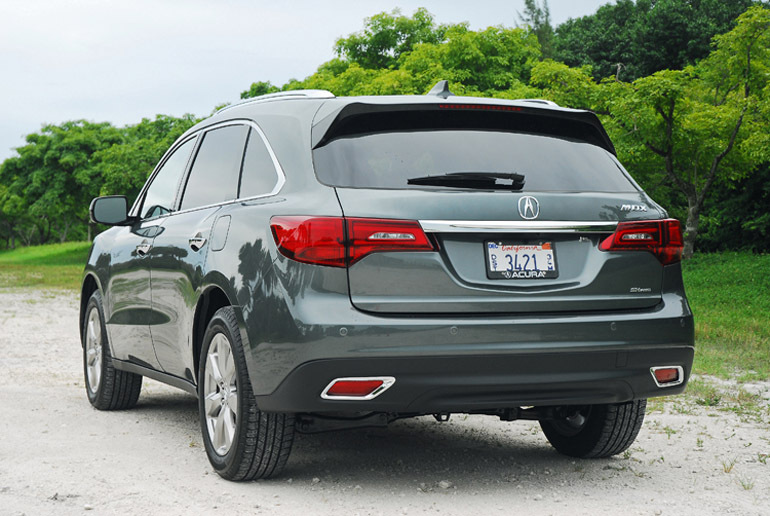 The MDX stops on a dime and in control thanks to standard ABS, EBD, BA, Hill Start Assist, Traction Control and Vehicle Stability Control that all work in concert to keep me in control when braking on slick, wet or loose road surfaces. My test MDX with the Technology and Advance Packages rides on 19X8 inch alloy wheels wrapped with 245/55R19 inch all-season radials tires. Even though the all-new MDX is primarily developed for pavement driving, you can take it off-road as it will climb up a 60-degree angle and ford up to 19 inches of water. Everything under the skin works in harmony in the all-new MDX to give an engaging ride with three different driving modes, a state-of-the-art suspension, and strong brakes to keep me safe when I tip the MDX to its edge of abilities. 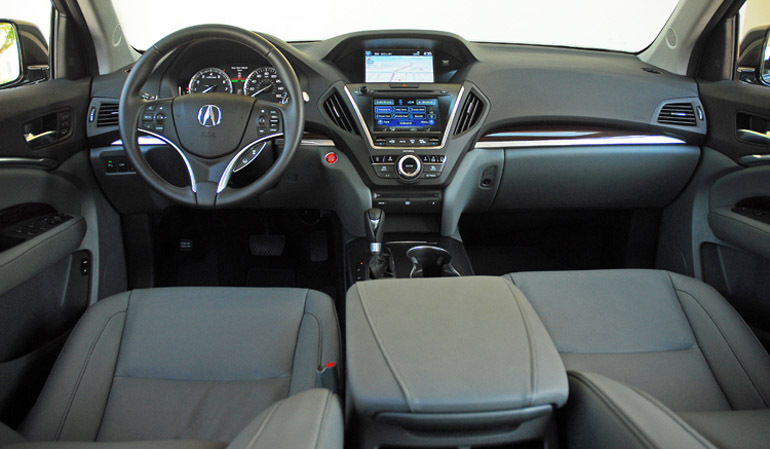 The interior of the all-new MDX is a perfect cockpit for the driver, the kids or a client by its luxurious and accommodating passenger compartment with roomy leather seating and a second-row seat with reclining seatbacks and a new Extended Slide feature that offers a total of 6 inches of fore-and-aft travel. 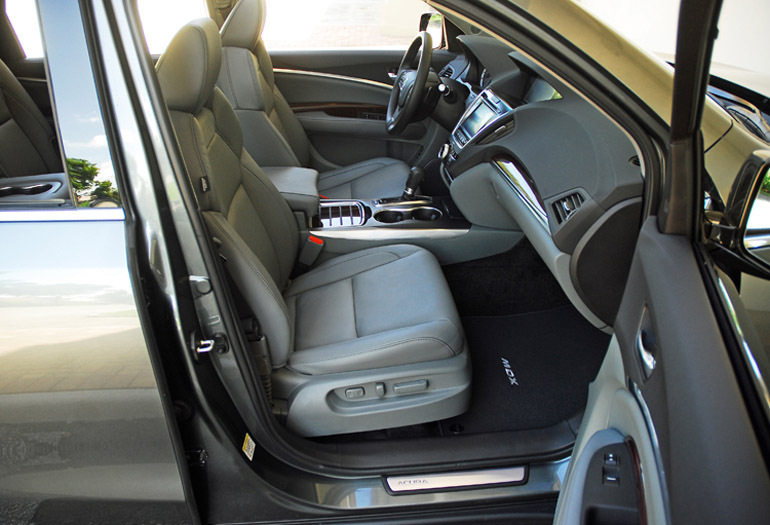 Also, a new kid-friendly One-Touch Walk-In feature greatly improves access to the third row of seating and a wider, lower step-in that enhances convenience and usability. Cabin quietness and overall refinement have been dramatically improved with hundreds of measures aimed at reducing noise, vibration and harshness including thicker 3-layer acoustic glass for the windshield and front side windows, thicker rear door glass, new triple side-sill down seals and Active Noise Control technology. The dashboard, doors and center console are trimmed in leather with real aluminum, wood accents and high-quality soft-to-the-touch materials. 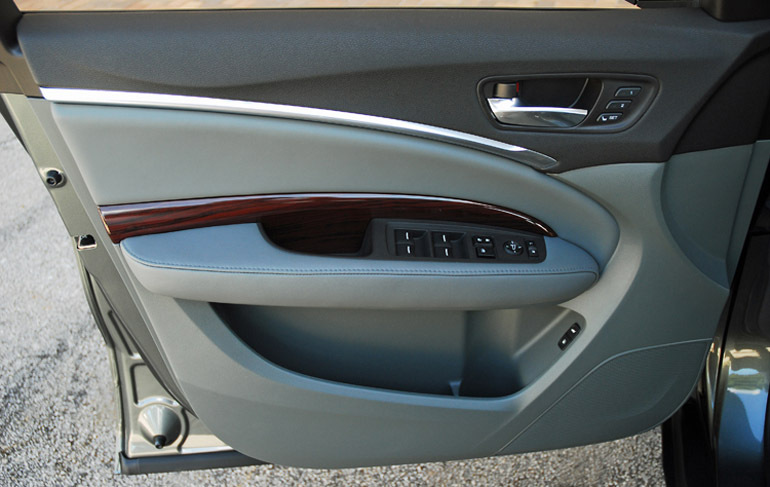 Repackaging of the rear-seat climate control system allows for a larger center console storage space, concealed beneath the sliding, leather-trimmed center armrest. About 2-inches deeper and wider and almost 5-inches longer, the main compartment offers 2.5 times more volume than the previous model and is large enough to accommodate a moderately sized purse, tablet computers and more. 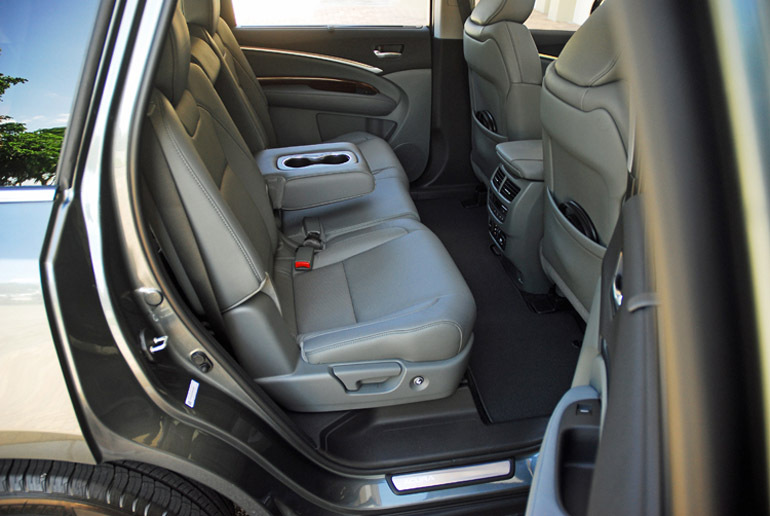 This is a key MDX advantage in the class, where many competing models offer little center console space. These new convenience features only add the interior for the driver’s cockpit with a sporty, leather-wrapped/power tilt/telescopic steering wheel that feels great in my hands, a rallye gauge cluster ringed with aluminum trim, fuel/engine coolant temperature gauges, center trip computer readouts and gear currently chosen. The center stack is like no other with the Acura On-Demand Multi-Use Display Touch Screen, and under it is another screen that controls the audio system and climate system. The front 10-way power-assisted driver’s seat and 8-way powered front passenger bucket seats are very comfortable and supportive with excellent deep side bolstering. The center console has dual cupholders ringed with aluminum trim and all buttons and dials are also ringed with aluminum trim for an upscale, luxurious look and feel. Standard features not mentioned above include a multi-angle rearview camera with dynamic guidelines, XM satellite radio, Pandora internet radio interface, Bluetooth hands-free link, SMS text messaging, 2-driver memory system, easy entry/exit steering wheel that lifts-up and away when exiting the vehicle, heated front seats, dual-zone climate control, push-button start/stop, power tailgate, power moonroof, all express up/down windows, power door locks, variable-speed wipers/washers, rear wiper/washer, self-dimming rearview mirror, grab handles above each door, storage slots in each door, dual map lights, dual lighted vanity mirrors, remote fuel filler door, remote power liftgate opener, pull-down center armrest with dual cupholders, signature Acura embroiled floor mats up front, under-floor rear cargo storage, and thick-cut pile carpeting. Standard safety systems include driver’s/front passengers dual-stage airbags, driver/front passenger side airbags with SmartVent, side curtain airbags with rollover sensor, driver’s knee airbag, agile handling assist dynamic braking system, ACE structure with front/rear crumple zones and steel beams in each door plus a tire pressure monitoring system and the LATCH system for child seats. My test MDX came with the Technology package that added Acura’s Navigation System with Voice Recognition, AcuraLink Communication system with RealTime Traffic with Street and Freeway conditions, Acura’s ELS Studio Premium Audio 5.1 Surround Sound System with a 546-watt’s and 12-speakers, a HD radio, GPS-linked Tri-Zone Auto Climate Control with air filtration system, Blind Spot System, LED puddle lamps, and rain-sensing wipers/washers. The Advance Package includes Collision Mitigation Braking System, ventilated front seats, remote engine start, Lane Keeping Assist system, Adaptive Cruise Control with Low Speed Follow, parking sensors and aluminum roof rails. The Entertainment Package includes an ultra-wide 16.2 inch DVD rear entertainment system with HDMI and wireless headphones, heat 2nd row seats, and rear door manual operated sunshades. Wow! 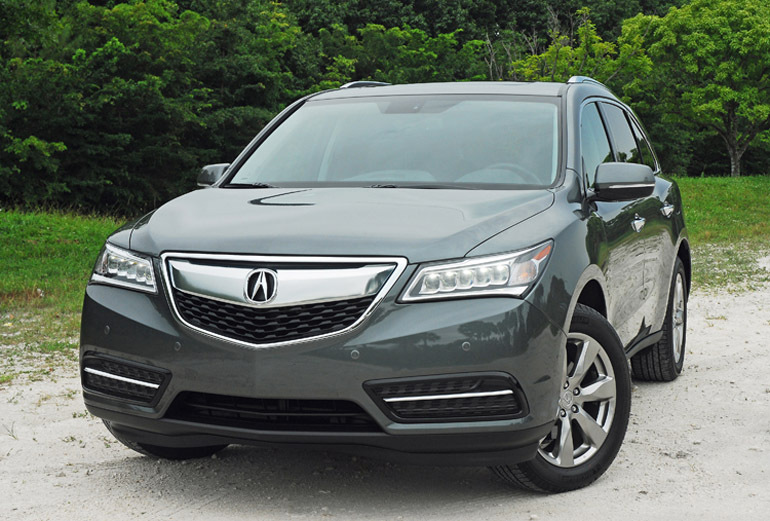 The all-new 2014 Acura MDX is even better than the last model which I truly enjoyed. This all-new edition has even more performance, luxury, convenience, safety, comfort, entertainment, infotainment and high-tech features that place it among the world’s best luxury performance mid-size AWD sport utility vehicles. Max cargo area: 3rd row down-45.1/2nd row down-90.9 cu.ft.